Utilizing patented QBC Capillary Tube Technology, the QBC Malaria Test is able to provide rapid malaria detection with a greater level of sensitivity than traditional Giemsa thick film methods. 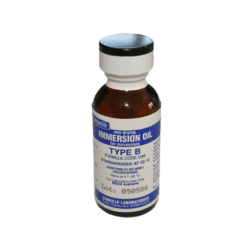 With all of the necessary staining agents contained within a single tube, this test is simple and efficient needing less than ten (10) minutes combined for both preparation and review. 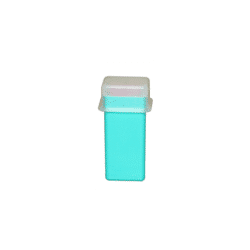 Designed to be used with the QBC ParaLens Advance System, or another fluorescent microscope, the QBC Malaria Test represents an innovative solution in malaria testing technology. Increased Sensitivity – compared to thick film analysis, with proven advantages in cases of low parasitemia. Time Savings – Results in as low as eight (8) minutes, a fraction of the time of thick film analysis. Reduced training time for new users. Simple Set-Up and Review – Improved sample collection and review for users through patented QBC technology. Respected, Proven Technology – Boasted FDA clearance and a long history of proven success in dozens of scientific studies. Training new users is just as rapid, as users with just five (5) days of training can provide results equivalent to an experienced microscopist using conventional methods.² In a study of 206 samples, new users averaged sensitivity of 95%, specificity of 98.4%, and correct speciation in 93.4% of cases. The QBC Malaria Test utilizes patented technology to improve sample collection and review for users. The Test features a 50 µL blood tube that can be used to collect either capillary or venous blood samples. 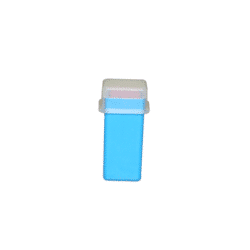 All necessary stains and reagents are contained within the tube itself, simplifying specimen processing. The use of centrifugation improves review for users, concentrating parasites within specific areas of the tube for easier detection. For a discussion on the scientific principles behind the QBC Malaria Test, please consult the technology section. The QBC Malaria Test was the first malaria diagnostic test to receive FDA clearance and its technology has been proven in dozens of scientific studies. For a listing of scientific studies featuring the QBC Malaria Test, please consult the Studies section. 1. Bentio, A.; Roche, J.; Molina, R.; Amela, C.; Alavar, J. (1994): Application and Evaluation of QBC Malaria Diagnosis in a Holoendemic Area. Applied Parasitology. Vol. 35: 266-272. 2. Namsiripongpun, V.; Pansamdaent, P.; et. Al. (1990): The Acridine Orange Stained Capillary Tube (The QBC System) in Diagnosis of Malaria: A Field Trial. J. Prapokklao Hospital Clinic Education Center. Vol. 7, No. 2. 3. Ponsilapatip, J.; Namsiripongpun, V.; et. Al. (1990): Detection of Plasmodia in Acridine Orange Stained Capillary Tubes (The QBC System). Southeast Asian Journal of Tropical Medicine and Public Health. Vol. 21, No. 4. 4. Tangpukdee, N.; Dangdee, C.; Wilairatana, P.; Krudsood, S. (2009): Malaria Diagnosis. Korean Journal of Parasitology. Vol. 47, No. 2: 93-102. 5. Oloo, A.; Ondijo, S.; Genga, I.; Boriga, D.; Owaga, M.; Ngare, D.; Gathecha, E. (1994): Evaluation of the QBC Method to Detect Malaria Infections in Field Surveys. East African Medical Journal. Vol. 71, No. 5. The interior of the QBC Malaria Test is coated with fluorescent acridine orange stain, which bonds with the nucleic acid of any malaria parasites present in the sample during preparation. When viewed under blue light (~460 nm), parasites stained with acridine orange will fluoresce brightly against a dark background. This greatly increases visibility, contributing to improved sensitivity. Before review, the QBC Malaria Test is centrifuged at 14,400 xg (12,000 RPM) for five (5) minutes. During the process, components of blood separate into distinct layers based on their differing densities. Parasites contained in the sample will also separate according to density, as seen in the illustration of a tube containing P. falciparum malaria on the right. This simplifies detection for users, as the parasites will concentrate into specific, easy-to-locate areas of the tube. A typical Giemsa stain uses just 2 µL of blood. In a case of low parasitemia (~1 parasite per µL), a thick film sample will contain just two parasites, making detection a difficult and time-consuming task. The QBC Malaria Test concentrates a 50 µL sample, meaning that, in cases of low parasitemia, approximately 50 parasites will be present. Because the sample is concentrated, parasites are easy to locate so review of this larger sample will take no additional time. 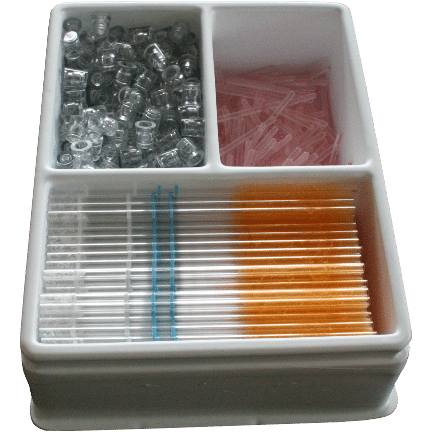 At what temperature should I store the QBC Malaria Test? The QBC Malaria Test can be stored from 16°C to 37°C (60°F to 99°F). How long can a centrifuged QBC Malaria Test be stored prior to review? Although it is recommended to review a QBC Malaria Test immediately after preparation, it is possible to store a centrifuged test for three (3) days at 16°C to 37°C (60°F to 99°F) or two weeks at 4°C (39°F). What kind of microscope is required to review a QBC Malaria Test? The QBC Malaria Test is designed to work with a fluorescence microscope. 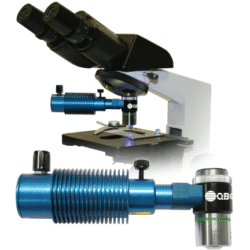 Drucker Diagnostics offers the QBC ParaLens Advance Microscope Attachment which can provide fluorescence capabilities to a standard light microscope. What kind of centrifuge is required to prepare a QBC Malaria Test sample? The QBC Malaria Test must be centrifuged at 14,400 xg rpm. the QBC Capillary Centrifuge was specifically designed to spin QBC Malaria Tubes, as well as other QBC blood tubes, to this specification. How do I focus my microscope on the QBC Malaria Test? If you’re using a ParaLens Advance lens of 60x magnification, apply 2 to 3 drops of immersion oil to the buffy coat layer of the tube. From a side perspective, visually line the lens to the buffy coat layer (the buffy coat layer will appear slightly fluorescent when aligned). Gradually lower the lens until it touches the oil. There will be a distinct wicking effect when they touch. Look through the eyepieces and begin to focus downward. When part of the sample is in focus, adjust the Y-axis until most of the surface area is in focus. Once a sufficient percentage is in focus, refrain from adjusting the Y-axis. Instead, manually rotate the tube using the tube closure. What type of sample is required for QBC Malaria Test testing? Whole blood samples collected from either a capillary stick or a venous blood draw (EDTA purple top tube). How much blood is required to test on the QBC Malaria Test? The QBC Malaria Test requires 55 to 65 µL of blood. How long can a venous sample be stored prior to testing in the QBC Malaria Test? Refrigerated samples stored at 2°C to 8°C (35°F to 46°F) are stable for up to eight (8) hours. How do I know if what I’m looking at is malaria? Malaria has several distinctive characteristics, many of which are unique to the species and life-cycle stage. For more detailed instructions on detecting and identifying malaria, please consult our training and literature resources. Can I quantify using the QBC Malaria Test? This system can aid in following the progress of a patient under therapy and in comparing the level of parasitemia from one patient to another. For complete quantification, no algorithm has been uniformly accepted in scientific literature. A study conducted by Benito et al. (Application and evaluation of QBC malaria diagnosis in a holoendemic area. Feel free to visit our studies page to read more) offers a possible algorithm for use with the QBC Malaria Test. Can I speciate using the QBC Malaria Test? 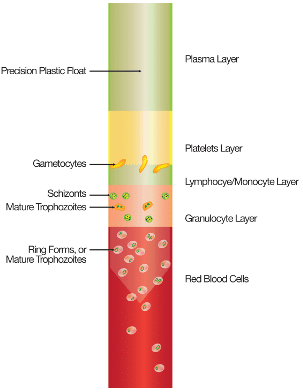 For proper speciation, many factors must be considered, including malaria morphology, location in the QBC tube, ratios between life forms, presence of multiple infections in a single RBC, morphology of gametocytes, staining characteristics, number of merozoites per schizont, and other characteristics. Reports have indicated that it is possible to speciate using the QBC Malaria Test, but it takes experience (Pornsilapatip et al., Detection of Plasmodia in Acridine Orange Stained Capillary Tube (The QBC System); Rickman et al., Rapid Diagnosis of Malaria by Acridine Orange Staining of Centrifuged Parasites. Feel free to visit our studies page to read more. In all cases, a thin film should be used for verification. The QBC Malaria Test can provide results in just eight (8) minutes, compared to 45 minutes to 2 hours with Giemsa Thick Films. This speed improvement allows users to increase lab throughput and make the most of their limited resources. Additionally, paratechnicians with only five (5) days of training on the QBC Malaria Test can achieve results comparable to technicians with months of experience using thick and thin films. That means less time spent in the classroom and more time spent providing tests and other services for patients. For all service inquiries, please contact the Drucker Diagnostics Technical Service Department at +1-866-265-1486 (US only) or support@druckerdiagnostics.com. Our Technical Support Representatives are available Monday – Friday, 8:30 am to 5:00 pm (EST). There are several resources currently available for use in preparing and reviewing the QBC Malaria Test. The Malaria Test Product Insert contains step-by-step instructions on using the QBC Malaria Test. Two Malaria Test User Guides, featuring full-color illustrations and photos, are available to help users of the test. The User Guide Sample Processing walks users step-by-step through the preparation of samples with the QBC Test, while the User Guide: Sample Review is designed to provide assistance to users during review. Finally, our ParaLens Advance/QBC Malaria Test Application Note contains many tips for using the QBC Malaria Test with the ParaLens Advance system. QBC systems have been in use globally for over 25 years with active installations on every continent, including Antarctica. There are over 15,000 active hematology systems worldwide and at least 1,500 fluorescent microscopy systems using our Malaria, Parasitology, and AFB kits. If you would like references for any of our innovative solutions from users near you, please contact us.